The RBI governor Dr. Subbarao surprised the Finance Minister P. Chidambaram today by reducing the cash reserve ratio (CRR) instead of the expected repo rate. Is this some sign of RBI acting independently? 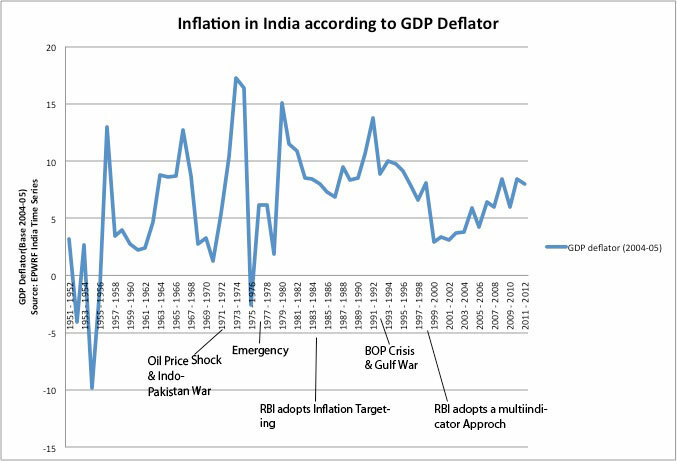 Is reduction in CRR is enough to ease liquidity and yet not contribute to inflation? How does the work anyways? Do changes in CRR matter at all? While all these are interesting questions and I plan to delve into them over time, I thought this following graph should be interesting. In the case where politicians have a very limited power to hire or fire a bureaucrat, is it possible that quality of politicians also affects the quality of governance? One would imagine that the answer to this question is no. But, politicians do seem to have some degree of influence on the bureaucracy through the process of reassignment and transfers even though they play a very little part in their hiring process itself. So it does seem likely that politicians shape the incentives for bureaucrats’ career advancement and hence the quality of bureaucracy is a response to these incentives. Iyer and Mani (2012) provide some theoretical and empirical support for this proposition. They develop a framework to empirically examine how politicians with electoral pressures control bureaucrats with career concerns and in turn how it affects the bureaucrats’ career investments. They find that the a change in the identity of the head of the state does increase the probability of bureaucratic reassignment. In a world where you cannot fire people, you just move them to a different state! Given this increased probability, officers with higher initial ability do experience less frequent transfers and variability of importance of their posts. However, there is not much difference in the likelihood of being assigned to an important post between a high initial ability bureaucrat and the ones that is just loyal. This implies that skill investment is not the only route for career success and hence this affects the quality of bureaucracy in equilibrium. Analysis based on a unique data set on the career histories of 2800 officers in the Indian Administrative Service (IAS) support these theoretical implications. A good example of forward looking behavior on the part of a self interested economic agent! Lakshmi Iyer and Anand Mani, Traveling Agents: Political Change and Bureaucratic Turnover in India, The Review of Economics and Statistics, August 2012, 94(3): 723-739.